Previously, on MinerBumping... Joden Ka struggled to accept the new highsec reality. Upon losing his mining barge, Joden appealed to the MinerBumping channel in a fairly disastrous performance. He declared that he never wanted to speak with anyone from the New Order again. Yet Joden soon found himself in a private conference with Agent TheInternet TweepsOnline TheInternet. TheInternet TweepsOnline TheInternet > When exactly did you last play? The miner hailed from 2011, the pre-Code era. No wonder he'd been so confused. He was one of those Rip Van Winkle miners. TheInternet TweepsOnline TheInternet > The fact is that the group I represent has the power necessary to enforce our claims, and nobody has managed to dislodge or defeat us. TheInternet TweepsOnline TheInternet > That's realpolitik. TheInternet made it known that the Order was here to stay. Joden hoped, perhaps, that if he disappeared for another six years, highsec might return to the way it was. But the Code is forever. TheInternet TweepsOnline TheInternet > You suggested you would leave Highsec rather than comply with the Code - and very publically. TheInternet TweepsOnline TheInternet > In a New Order channel. TheInternet TweepsOnline TheInternet > I tried to warn you that you weren't making your case well, but you insisted on ignoring my warnings. Joden tried to make excuses for his earlier conduct. Our Agent wasn't buying it. The miner had dug quite a hole for himself, but TheInternet could help him out of it. Joden Ka > ok so how can we resolve this situation we find ourselves in? For the time being, Joden was willing to put aside his grudge against the New Order and focus on finding a solution. That attitude would soon be tested. TheInternet TweepsOnline TheInternet > You will need to purchase a mining permit at the 30m ISK Red Pen Violation rate. TheInternet TweepsOnline TheInternet > I would suggest you borrow the ISK from a friend. So many miners fail at this point in their journey. They simply can't imagine giving up any of their isk--not to another player. They are bot-aspirants. TheInternet TweepsOnline TheInternet > Frankly, mining is a terrible income - if I were you I would do something else. TheInternet TweepsOnline TheInternet > I've got an idea for you, as it happens. TheInternet TweepsOnline TheInternet > Not today, but tomorrow - what you should do is head to Jita. Bring a T1 hauler with a MWD. TheInternet TweepsOnline TheInternet > Do as I say and the rest should come naturally. TheInternet came through on her promises. She offered Joden the chance to make a lot of money and actually enjoy the game. Joden Ka > ok why? Joden Ka > so you guys can kill me again? TheInternet TweepsOnline TheInternet > Hardly. TheInternet TweepsOnline TheInternet > I haven't given you a time. TheInternet TweepsOnline TheInternet > You think we're going to camp Jita all day just for you and a T1 hauler? As usual, the miner was his own worst enemy. He ignored TheInternet's wisdom. TheInternet TweepsOnline TheInternet > Do as I said, when you get the ISK, come and pay your debt to me. TheInternet TweepsOnline TheInternet > Have a bit of faith here. A lack of faith is one of the biggest reasons miners are unable to succeed in EVE. That's another thing they should put into the official tutorial. The miner bristled. Joden must've known that TheInternet had far more success and experience in EVE than he did, but his pride kept him from listening. It's amazing how noble and respectful and generous miners can be in hypothetical situations. In actual situations, they're anything but. TheInternet made Joden contemplate, for the first time, a new possibility: He didn't have to mine. He didn't have to mine! TheInternet TweepsOnline TheInternet > Mining indulgences are required for all Highsec activities, including mining, hauling, mission running, etc. TheInternet TweepsOnline TheInternet > We regularly police the commerce lanes for illicit freighter traffic. The bot-aspirant's narrow, programmatic view of the world got in his way again. He'd been so close to an important realization about not needing to mine. TheInternet TweepsOnline TheInternet > You're going to try and explain to me what the permits we sell do? Joden drifted back into the mire of miner clichés and bot-aspirancy. Despite the miner's difficulties, simply being in the presence of a New Order Agent was bound to have a positive impact sooner or later. TheInternet TweepsOnline TheInternet > Of course not, you are free to leave Highsec. The conversation was too philosophically challenging for Joden. He could not bear to continue. After the convo with TheInternet, Joden had a change of heart. He sent a message to Agent Zopiclone--the ganker to whom he'd been so rude before. At last, Joden admitted to himself the power of the Code. 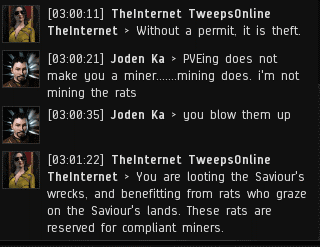 He was unwilling to buy a permit, so he chose to abandon the path of the miner, leave highsec, and join a nullsec alliance. 'Twas another victory for the New Order and its slogan: "No miner left behind." Haha. Internet and Zopiclone win via the CODE. The anti gankers failed incredibly hard. The End! I checked the description of the corp Joden Ka joined. (Do you) "Like to blast asteroids?" was the first line of the pitch proper. Something tells me he'll be ignoring future family requests for tête-à-têtes requiring him to mine AFK. Out of Highsec; out of mind. "Have you considered being a rebel leader?" a snarky comment from so many gankers that it's now cliche. Rebel Wanted Bot-Aspirant, your blog is so boring that I now recommend it as a sleep-aid. Have fun dolling out ranks and awards as if you're a bunch of trekkie kids trying to be a real Admiral or something. The other day I found one of my permit holders mining in a Hulk, and warned him against excess mining. Two hours later, and well into the night, he was still gorging on Veldspar. I instructed the miner to immediately dock-up and proceed to bed. He refused, and was subsequently terminated. Unfortunately despite repeated invitations to become Code compliant, miners will frequently ‘bite the hand that feeds’, and lash out at the very people who are trying to help them. Often they must be subjected to systematic, merciless, and relentless punishment, until they learn self-discipline and become Code compliant, or quit EVE. This is the way it should be. Assuming he made 15m ISK/hr you set him back 20 hours for his defiance. 22 hours if you count the red pen fee. Yeesh. Wow... That's supposed to be a sales pitch? o.O FAIL. Initially I had bot-aspirant tendencies by wanting to try 'relaxing' mining. Then it turned to 'grinding isk'. Then I discovered the CODE and turned to enforcing the CODE. My life in EVE is much more interesting now. Prideful miners have no place in James 315 territory. Could you please describe for us in further detail the interval at which they are currently failing? There's even a website for it: minerbumping.com. You may have heard of it. Rats do not graze has got to be one of the most hilarious miner comebacks I've read on this site.